* Best known for his darkly comical novella The Metamorphosis, Kafka is a master of the short story. Offering compelling satires on the human condition, A Country Doctor: Little Tales and A Hunger Artist: Four Stories; uncollected works; and a selection of posthumously published tales offer an engaging introduction to this acclaimed 20th-century writer. 288 pages, softcover from Oxford University. Kafka published two collections of short stories in his lifetime, A Country Doctor: Little Tales (1919) and A Hunger Artist: Four Stories (1924). Both collections are included in their entirety in this edition, which also contains other uncollected stories and a selection of posthumously published works that have become part of the Kafka canon. Enigmatic, satirical, often bleakly humorous, these stories approach human experience at a tangent: a singing mouse, an ape, an inquisitive dog, and a paranoid burrowing creature are among the protagonists, as well as the professional hunger artist. The tales are among Kafka's best-known, haunting and compelling satires on the human condition, on art and artists, and on life itself, which complement his major fictions. Translated by the award-winning Joyce Crick, the book includes an invaluable introduction, notes, and other editorial material by renowned Kafka scholar Ritchie Robertson. There is also a Biographical Preface, an up-to-date bibliography, and a chronology of Kafka's life. 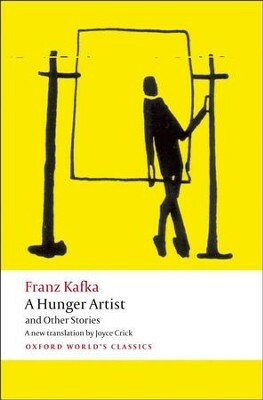 This volume completes an Oxford World's Classics set of five Kafka works, in distinctive complementary cover designs. Joyce Crick taught German at University College London until her retirement. Her translation of Freud's The Interpretation of Dreams won the Shlegel-Tieck Prize in 2000. Ritchie Robertson is Taylor Professor of German at Oxford University and co-director of the Oxford Kafka Research Center. I'm the author/artist and I want to review A Hunger Artist and Other Stories.